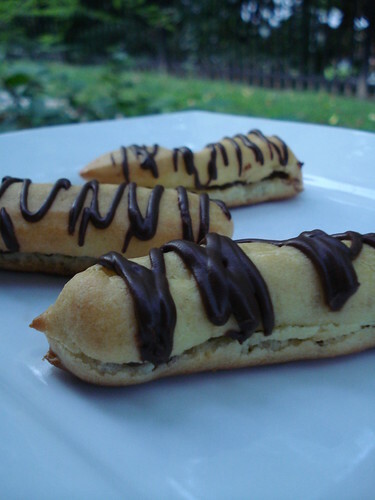 Yay for french finger food! (yummm if only fingers tasted like chocolate all the time…hahah). This challenge was the easiest one so far, but nonetheless it was very fun! These babies were made over two nights with moral support from my new favorite executive chef M! They were enjoyed by us and by abuelita! Feliz Santa Elena Día! 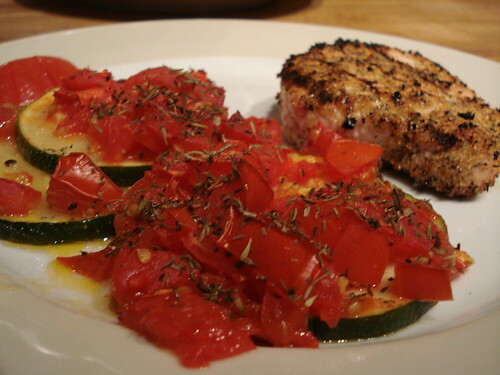 Turkey Chops with Baked Zucchini & Tomatoes + Pitango! Executive chef M (not actually an executive chef… haha..but nonetheless henceforth will be referred to as ECM) prepared this lovely meal for me on Wednesday night! Based on my strong suggestions (what? bossy bissy? who me?? ), we baked the zucchini with tons of garlic, dried thyme, evoo, s&p and tomatoes from dad’s garden! He grilled up some turkey chops with McCormick’s grill mates chicken seasoning (which is wayyyy salty but still very tasty!). What a delicious meal! And to top off the evening, Pitango was in order! Friday night was spent in lovely Alexandria, VA and it was spent making Fajitas! The fact that this is the first time I have made such a lovely feast is quite shocking! Thanks to Erica for the idea! The rub came from an old xmas present (which has been sitting in my kitchen for 2 freaking years! 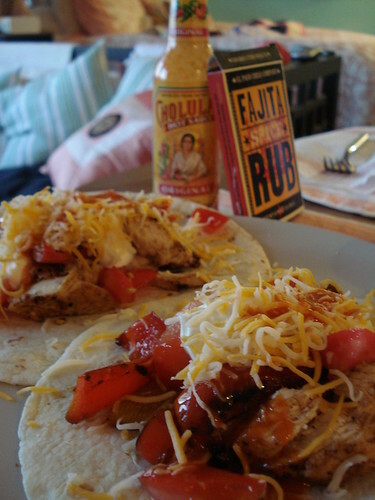 and was quite lumpy…hahah) and complemented the chicken and assorted fajita ingredients very nicely! I sautéed red and yellow peppers and some onions, added tomatoes, four cheese, sour cream and cholula (for extra palate excitement!). This was Laurita and my nice fast meal from last night. Yes, the color scheme is definitely in preparation for those fall leaves coming around here soon! 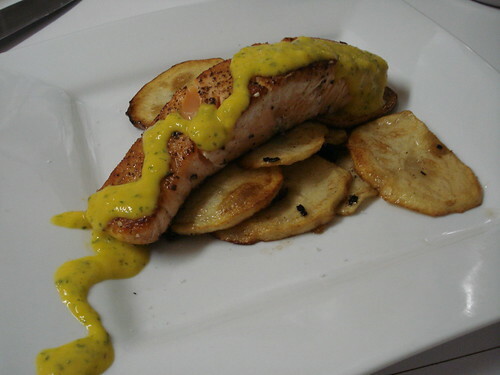 The mango sauce is a winner. ALWAYS. And, this is the first time I have ever fried up (sautéed) potatoes! Crazy! Friday night happy hour was spent very happily with my girl, Jesica, and at Annabel Lee Tavern (within walking distance of her place! yay!). Neither of us had ever stopped by and boy are we glad this neighborhood has been bestowed upon by such a gem! Here, below, is an Ozzy (yay Brewer’s- The owner used to be a bartender there!) 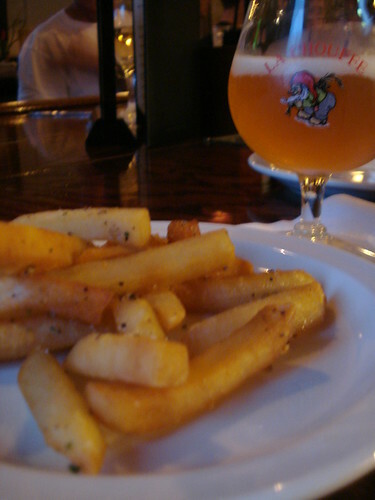 and the most succulent and delicious duck fat french fries that Bawlmer has to offer! This meal was fantastic. I don’t know if it is just because my mind is on cloud nine right now or what! But I am surely seeing that everything taste better when life is swell and when you have the freshest most delicious ingredients! This is the first real foodie meal I have made for just myself in a long time. 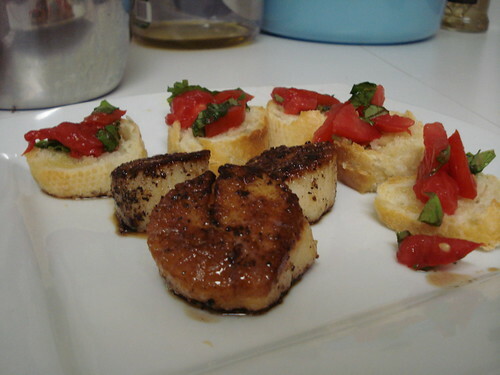 The scallops are fresh off the ice at wegmans (just sauteed in lots of butter and lots of s&p) and the tomatoes came from papa’s garden, basil from my lovely plant and baguette with olive oil also fresh from wegmans! C’est Magnifique! Well Thursday night was quite a lovely one on the town! Checked out the Body Worlds exhibit (not too appetite enhancing.. but nonetheless very fascinating!) Dinner at Thai Arroy in Federal Hill was delicious! I ordered (which is now becoming a standard) drunken noodles with duck! 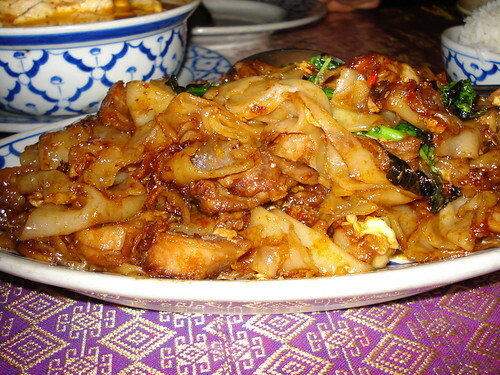 I would have to say that Thai restaurant has tastier drunken noodles, but this duck meat was fantastic! Check out the rest of dinner below. 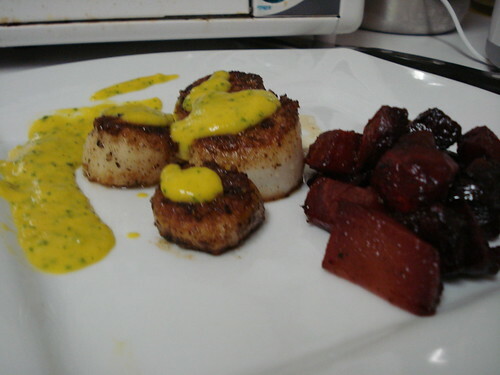 Monday night’s dinner was simple, quick and delicious! 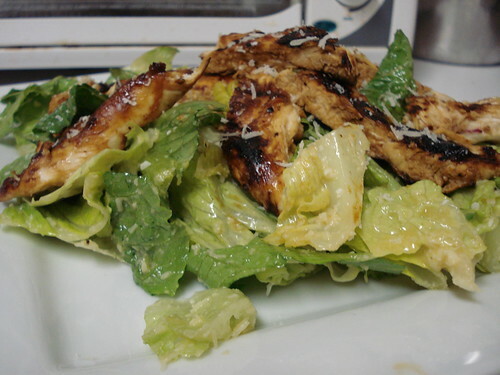 I have been making caesar dressing from scratch for a while now (thanks to my New Best Recipe cookbook!) 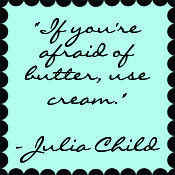 and it is FAR superior to those little packets that come in bags of salad! On the way home from Burlington last weekend, I spent the weekend in New Haven, CT visiting my bestest buddy Becca to help her celebrate her 25th birthday!! 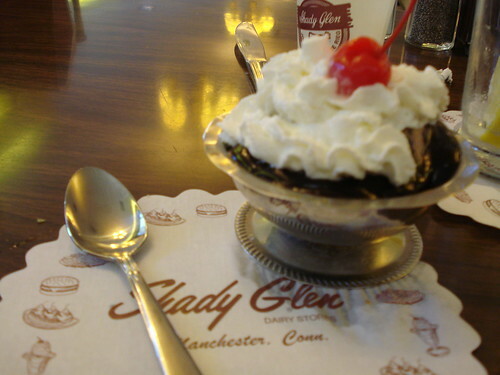 She knew of this classic diner that serves crazy cheeseburgers and is an amazingly classic and retro joint: Shady Glen. So cute! Here is our dessert (peanut butter chocolate ice cream sundae) (2 of them!) which was delicious and we also got their claim to fame cheeseburger!